A New York City nuisance map today would consist of things like text-walking zombies, pizza rats, and Soul Cycle locations. But back in the 19th century, people had bigger problems, such as manure heaps, hog pens, and 400 families wading through “a disgusting deposit of filthy refuse” just to get home. 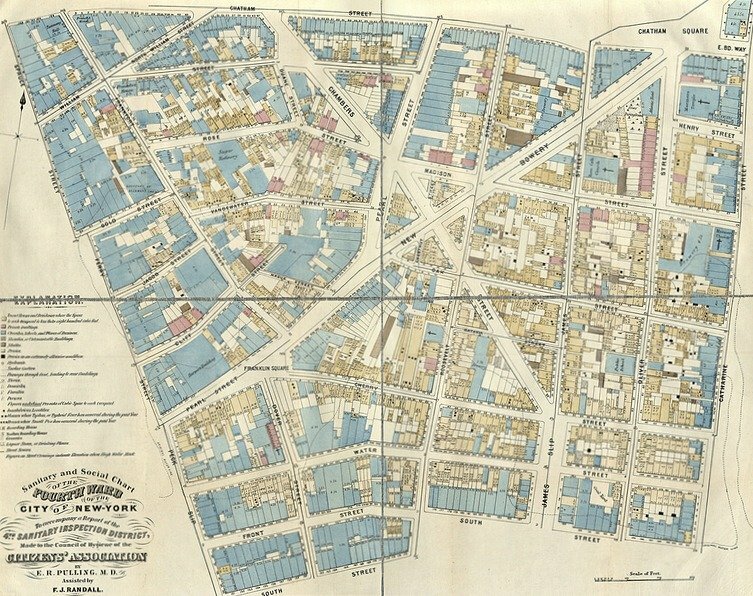 Atlas Obscura uncovered these amazing maps that were created in 1865 by the Citizen’s Association of New York as part of a 300-page report on the city’s sanitation and public health conditions in the wake of the smallpox and typhoid epidemics. “Rapid population growth, overcrowded apartment buildings, dirty streets and poor sanitation standards had meant that New York in 1860 had the mortality rate of medieval London,” according to the blog. We, the citizens of Lower East Manhattan, declare that this city is unsuitable for human development, child development and moral development. We, citizens of all classes, have suffered from deadly diseases such as cholera, tuberculosis, small pox and pneumonia at the hands of public officials who scoff at our sufferings. We believe that housing, politics, morals and health are all intertwined and without one, we would be quite at a loss. Two maps were included in the report, the first of which looked at what was then considered uptown, 34th Street to 48th Street. “Encroachment of Nuisances upon Populous Up-town Districts” plotted the west side’s slaughterhouses (there were 173 total in the city at the time), stables, distilleries, hog pens, gut-cleaning outposts, and pork packing sites. The far east side also had a share of stables and breweries. 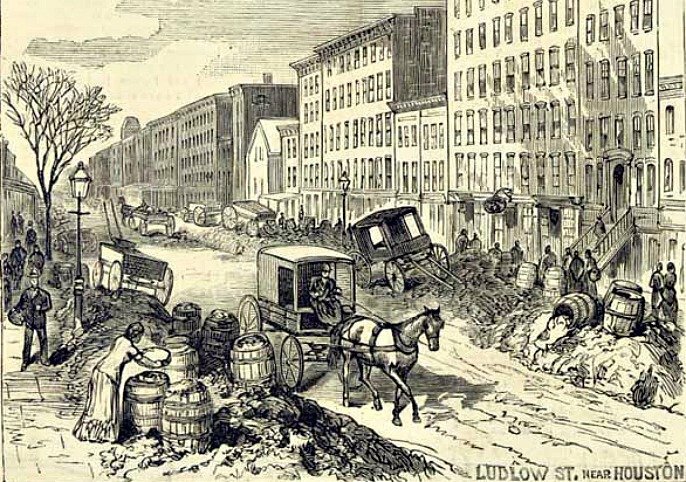 There were up to 200,000 horses in the city, each of them producing an average of 22 pounds of manure and a quart of urine a day, all of it either being left along the street or piled in stables. The year after the report came out the Metropolitan Board of Health was created under a new law that said at least three of its nine commissioners had to be physicians, eventually leading to city-wide sanitation reforms.